Digital transformation can be thought of as embracing digital technologies to improve the efficiency of manual processes; many identify digital transformation in the office with going paperless, which typically includes Enterprise Content Management or Document Management Systems. Transformation should be the development of new and innovative ways of doing things, rather than simply supporting and improving traditional methods. In a recent article by IT World Canada, they identified that 38% of Canadian executives in large enterprise companies are rolling out their digital transformation strategies, and 50% of them are in the planning and building stage, with 12% still trying to determine a plan. What is interesting is that it is very hard, as well as very expensive to transform a large enterprise. There is also typically a significant disconnect between the “C-level executive” and the front line employee. Canadian mid-market companies are slower to move, with 31% of them taking steps toward digital transformation. However, what is extremely interesting is that the significantly large group of mid-market companies in Canada, are actually much more nimble, and with limited investment can more easily make strides towards significant efficiency gains through digital transformation. They can do this one step at a time without stalling or impacting departmental throughput. Another supporting factor is that mid-market companies have more readily adopted cloud technologies, so they are perhaps more ready for transformation than they realize. Here’s an example of a simple workflow integration to a Document Management System and ERP or financial system. a. AP Clerk scans paper invoice to input into AP workflow. b. Fax technology monitors inbound fax over IP for invoices and automates input of invoice to AP workflow. c. Email technology monitors inbound AP email for invoices and automates input of invoice to AP workflow. d. AP Clerk drags and drops digital invoice files that may have come from other digital sources to input invoice to AP workflow. 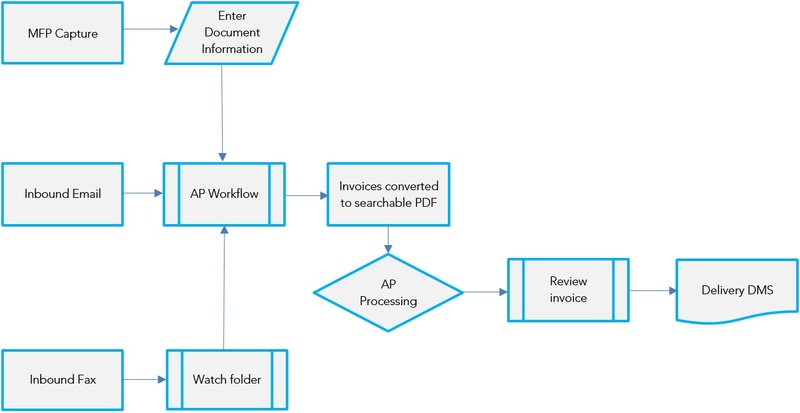 Once the invoice is input into the AP workflow, the processing engine captures the document, converts it to a text searchable PDF, and captures the important data (i.e. company, invoice number, purchase order number etc. ), then matches the important data with the financial system's AP data and routes the document to the AP clerk's workspace (Electronic Document Management System or Document Control System) and is ready for the operator review step. AP clerk reviews to ensure that the document is correct and approves it for payment. Approve payment in financial system and save and link document for records and audit. This is a very simple workflow example that can be implemented easily with workflow software that is integrated into a financial system and an inexpensive cloud-based document management system to support digital storage. Your managed print services partner should be able to recommend the appropriate hardware and software, and manage a proof of concept through to full production and final implementation. We typically see that automating the AP process will cut processing time by 60% - 70% - now that's efficiency! Your organization may be ready for this. Keep in mind that similar, very simple digital workflow processes can be implemented for HR, other finance functions, quality control in production areas, etc. Organizations may not be ready for a complete technology revamp quite yet i.e. integrating all systems inside and outside of your firewalls. There are so many complexities - all of the organizations your organization deals with would have to support the same systems, standardized protocols and documents. A total technology revamp won't happen overnight, it will take a considerable amount of time but for now, your digital transformation can effectively be supported one step at a time. 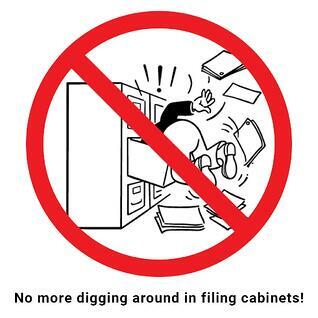 It’s time to get rid of those filing cabinets and transition to inexpensive, integrated cloud-based document management systems. Don’t invest in technology before you figure out the future state! Before you select a partner to implement your document workflow or document management system, make sure that they have the ability to configure the system to support your business processes - not the other way around. We more often than not see companies invest in software that typically has way more capabilities than they will ever use. Keep in mind that lower cost, open architecture solutions are available. Ready to determine the optimal way to configure your document management system? Read this MPS case study to see how Halton Healthcare's Oakville Trafalgar Memorial Hospital saved 45% in print hardware reduction through optimized document control.